@Sergio asked about the pdf creation process in the showcase thread about my 360° feedback/survey tool and so I went ahead and set my little pdf helper module to public. 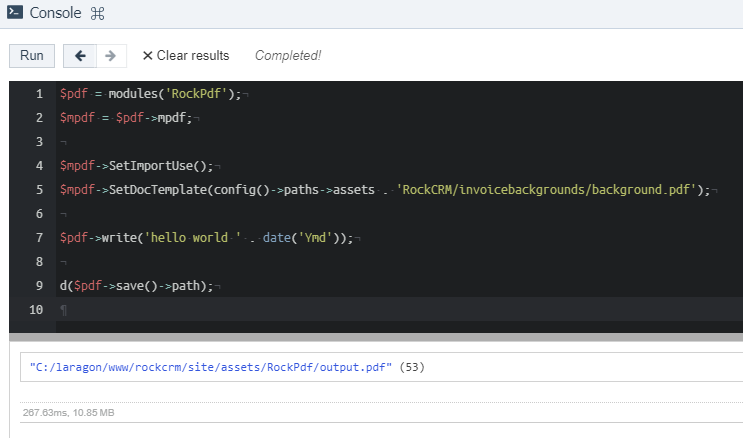 First of all you have access to an instance of mpdf anywhere in your template or module files simply by calling $modules->get('RockPdf') – no need to include any additional files or anything like that. 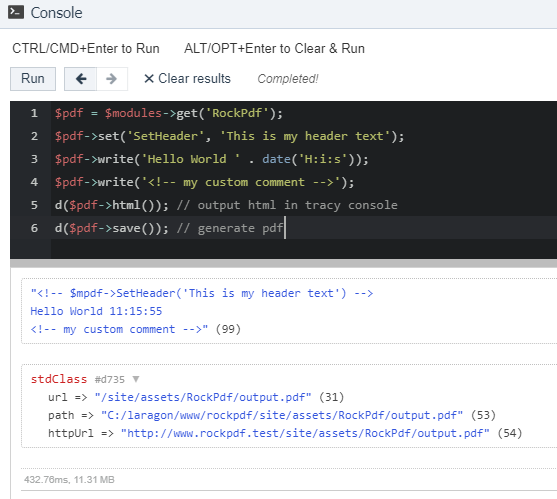 RockPdf makes debugging layout issues notably easier by embedding parameters passed to its functions as HTML comments into the generated markup, and also by giving you an easy method to fetch the generated markup as-is. While mpdf by default includes a massive blob of fonts, with RockPdf you get only the ones you really need – and you can still add more if needed, just by dropping the font files into specific directory. Perhaps the most notable benefit from using RockPdf instead of directly including mpdf is related to the first bullet point above: by using RockPdf you get to keep your template and module files clean, and the API usage is always consistent. As an added bonus you also don't have to worry about keeping the mpdf library manually up to date. 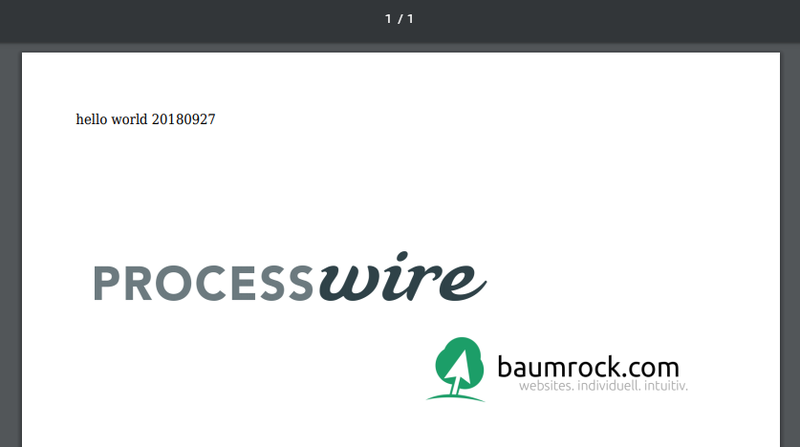 Featured in ProcessWire Weekly #215. Thanks a lot for sharing @bernhard! It got me thinking about making a PW helper module to make things a little more sane to deal with. I decided to see how others were dealing with PDF creation within ProcessWire, and whaddya know — what I was imagining already exists. Thx for reporting! I can have a look next week or maybe you can do a pr or share your investigations until then? Did anyone else encounter problems with `show()` and `download()`? If I use them, all I get is blank pages resulting in an invalid PDF. The `save()` function works as expected though. No problems here. Which Browser? Can you try whether using the original mpdf code works (without using my shortcuts)? Latest Chrome/Safari/Firefox on macOS 10.14 show all the same problem. The weird thing is it creates the correct amount of pages in the PDF, they’re just blank. Calling `$mpdf->Output($filename, \Mpdf\Output\Destination::DOWNLOAD);` directly results in the same error. Hey @charger, thx for that info. Could you please check if that is the same in a non-pw setup? I mean creating a php file only for that purpose, importing mpdf, creating the pdf and trying the show() and download() equivalents of mpdf? @bernhard download() and show() both work outside of PW. What kind of mime-type errors? And how could that be related to PW only but not the webserver or PHP in general? I also just checked it on the webserver (was on localhost before): same problem there. It’s weird that one option would work while the other two wouldn’t. I can’t make sense of it atm. JqueryCore.js?v=1539002242:2 Resource interpreted as Document but transferred with MIME type application/pdf: "http://www.rockcrm.test/site/assets/files/1156/hn2018-029.pdf?modal=panel&pw_panel=1". Hmm, that didn’t help on my side. I still see the "Unable to remove" errors in the wire-temp-dir logfile, now they’re just referring to the newly set directory. And yes, these are more complex PDFs, but not overly complex (~3MB). If the PDF takes long to render it can happen that this folder is deleted automatically before the PDF is done. PW can set the mime type, so I guess it could be related to it. But I've never used this feature, so I don't really have an idea. This will not work for me as I generate the PDF if there’s a "pdf" GET parameter found (this is e.g. how https://github.com/wanze/Pages2Pdf handles it as well). That’s why I was pursuing another way meanwhile: the wireSendFile() function (https://github.com/processwire/processwire/blob/master/wire/core/Functions.php#L257, https://github.com/wanze/Pages2Pdf/blob/master/Pages2Pdf.module#L312). However, the problem remains: the PDFs do get saved correctly, but when trying to download them (either via wireSendFile() or RockPDF’s download()), they are blank or corrupted. Thanks for the hint, wasn’t aware of that. But if the default age for a temp folder is 120 seconds, then that should be plenty of time already. The PDF generation maybe takes around 3 seconds. Thx robin I know about that but somehow it didn't work. I need to see why and when that happens, but setting the maxage didn't solve it unfortunately.